This Week in Weird Science: Like humans, pigeons can share stories across generations. For pigeons’ sake, let’s hope they won’t have to deal with grandfather’s who endlessly talk about their fishing lessons as a child in Muskegon. Next, we talk about the worst ways to die. Turns out: Sleep won’t kill you but a particle accelerator definitely will. And, lastly, we see what happens when a Soundgarden song comes to life: a black hole sun washes away much more than rain. 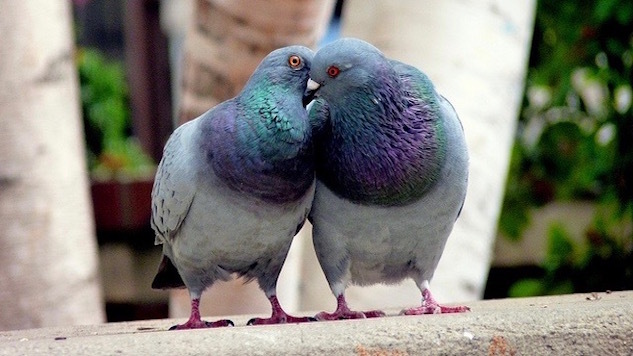 Pigeons can share information across generations. It was previously thought that only humans and some species of primates could transfer knowledge from generation to generation. New research out of the Department of Zoology at Oxford University in the U.K. indicates that homing pigeons also share this ability. In doing so, the researchers have made the film The Birds scarily accurate and that much more terrifying. The study, published in Nature Communications, analyzed how homing pigeons can gradually improve their flight paths, over time—like from North to South … or from sky to Tippi Hedren’s hair. To accomplish this, ten chains of birds were released from the same site and “generational succession” was simulated with the continuous replacement of birds familiar with the route and and those who’d never flown the course. The idea was that the birds familiar with the route would pass their expertise to the Clark Griswold’s of the bird-world. As it just so happens, the student becomes the teacher and those birds most familiar with the journey passed their learnings onto the newcomers. Let’s just hope that these animals won’t also be subjected to the “collective intelligence” of, say, how to flea a bear, according to that one time Grandpa got lost in the woods outside of Muskegon. What are the worst ways to die? Death by sound? Explosion? Super soaker filled with chlorine trifluoride? The question’s been covered extensively. Would you rather die by freezing to death or burning to death? Would you rather die by drowning or dehydration? What’s the worst way to die? A physicist and a writer spent the last two years pondering the absolute worst ways to die, from outlandish to gruesome to extreme to “death by the devil’s Super Soaker” and wrote a book about them: And Then You’re Dead: What Really Happens If You Get Swallowed by a Whale, Are Shot from a Cannon, or Go Barreling over Niagara. The duo, writer Cody Cassidy and co-author Paul Doherty, a senior scientist with the Exploratorium Museum in San Francisco, took to Reddit for an Ask Me Anything (AMA) about their grim findings like “what would happen if you swam out of a deep-sea submarine, were swallowed by a whale” ... which can happen and will in fact kill you. Uhhhh, yeah. “A shock wave from a bomb blast or meteorite strike can produce a pressure wave which will blow out the alveoli in your lungs. And maybe the 190 dB sound wave would destroy alveoli as well. Any volunteers?”, answered the authors. According to the authors, both deaths would be spectacular—though it’s definitely possible to survive the particle accelerator, as exhibited by Anatoli Bugorski, who survived a beam of the Russian U-70 accelerator through his head. Thankfully, the team did manage to answer a few questions that have been bothering stoner philosophers for decades like if you’re trapped in a falling elevator, will you survive if you jump before reaching the bottom? No, you won’t survive. And that seems to be the moral of the story. Anything and everything can kill you. What happens when a black hole meets the sun? Hint: It won’t wash away the rain. “Black hole sun, won’t you come, and wash away the rain?” This video suggests that a collision course between a black hole and the sun—or simply a star in this case—may not wash away the rain, but it’s definitely breathtaking. This phenomenon is called a “tidal disruption event,” in which tidal forces of the black hole pull the star into its center through “spaghettification”—an actual scientific term that does not mean “the process of transforming household objects into spaghetti like this author originally thought. Spaghettification is, as perhaps expected, the compression of objects into a noodle-like shape. Think: What happens to a cartoon character’s arm when an anvil falls onto it. And it’s actually pretty terrifying. That said, if a black hole sun could wash away the rain, based on “the noodle effect,” one could realistically expect something cloudy with a chance of meatballs.